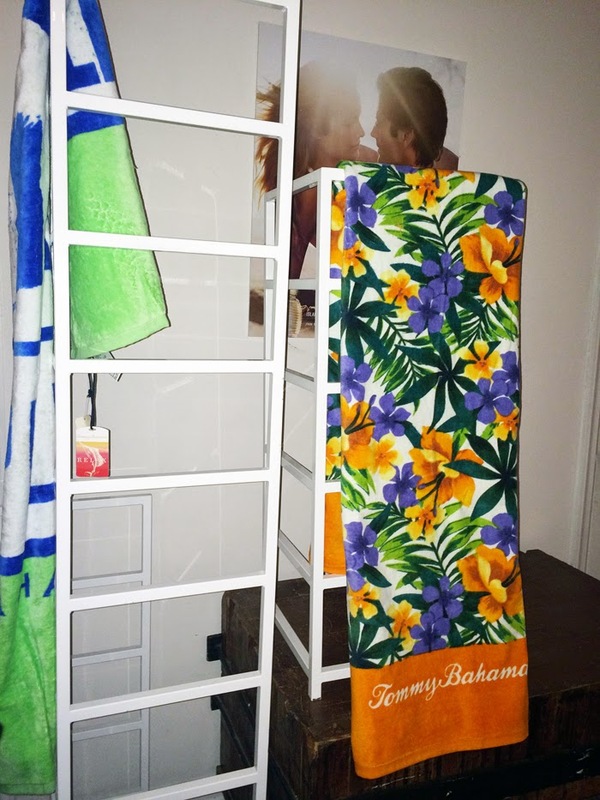 The Style Socialite - A Fashion/Society Blog : Tommy Bahama’s Island Life Oasis: Celebrating The Launch Of Their New 'Island Life' Fragrance Collection! 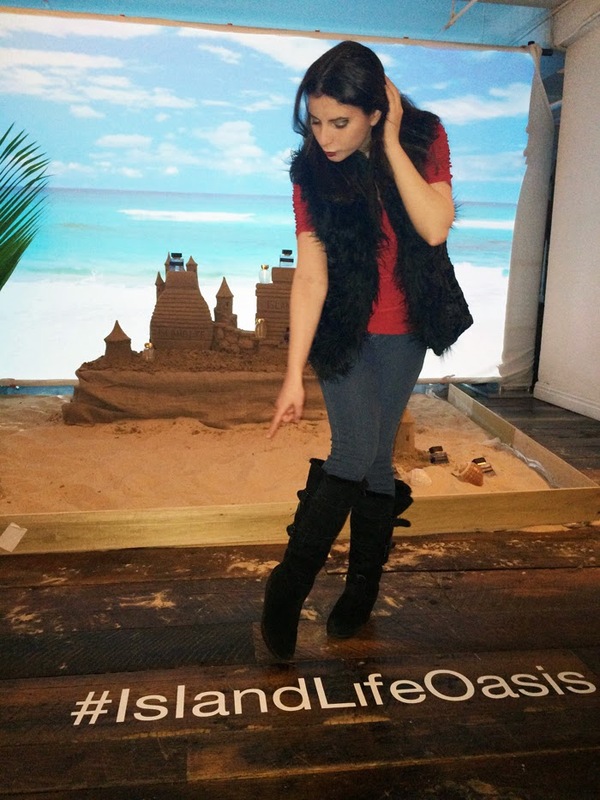 Tommy Bahama’s Island Life Oasis: Celebrating The Launch Of Their New 'Island Life' Fragrance Collection! 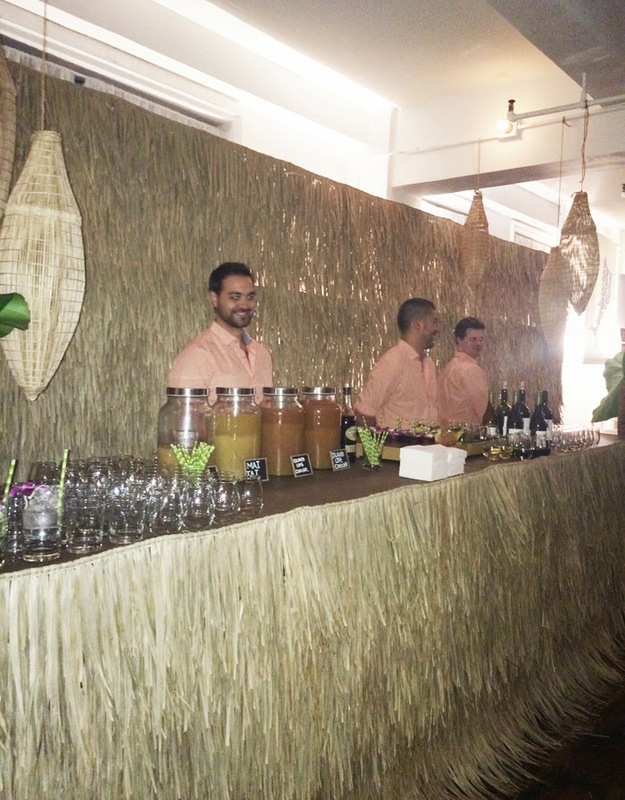 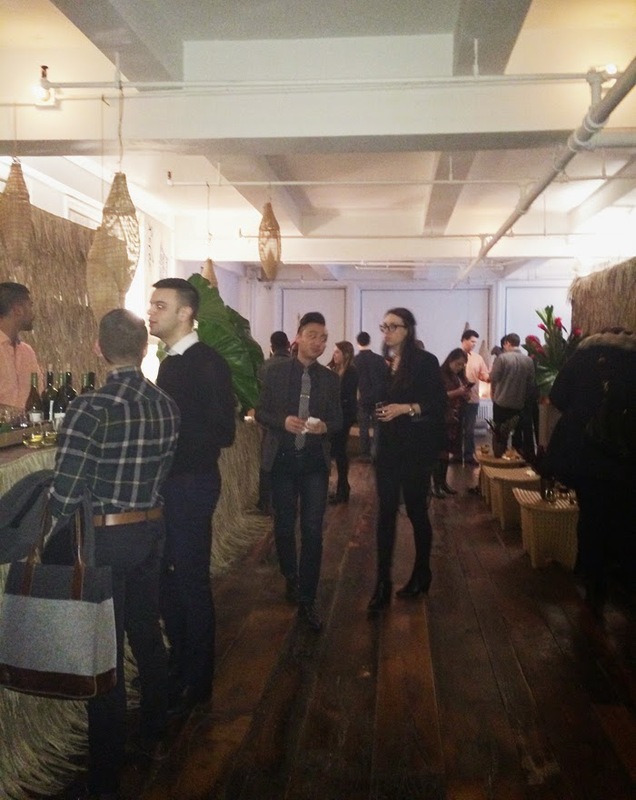 Tommy Bahama hosted an Island Life Oasis in celebration of their newly launched fragrance collection, Island Life. 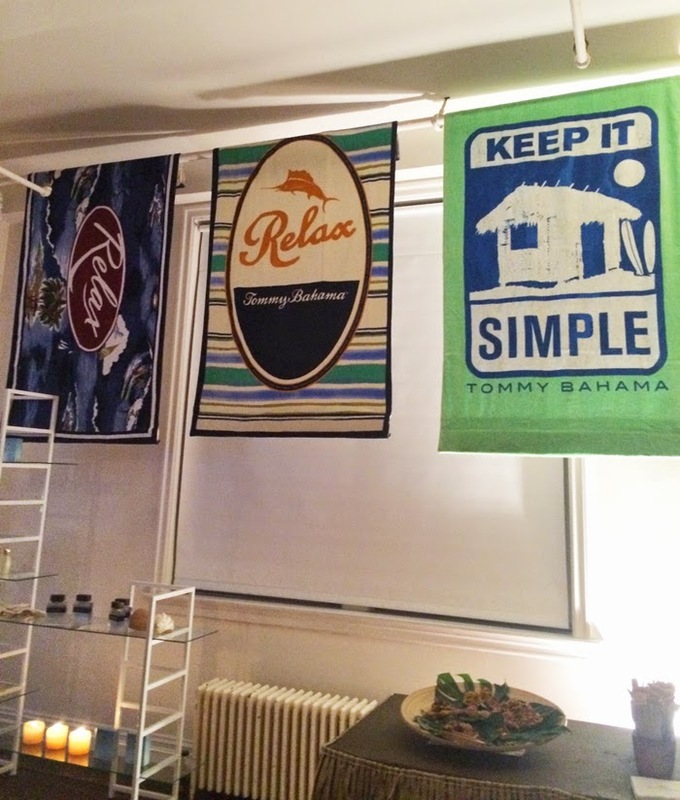 The invitation read “Join Tommy Bahama for a tropical escape of Island Life to new his and hers fragrance collection. 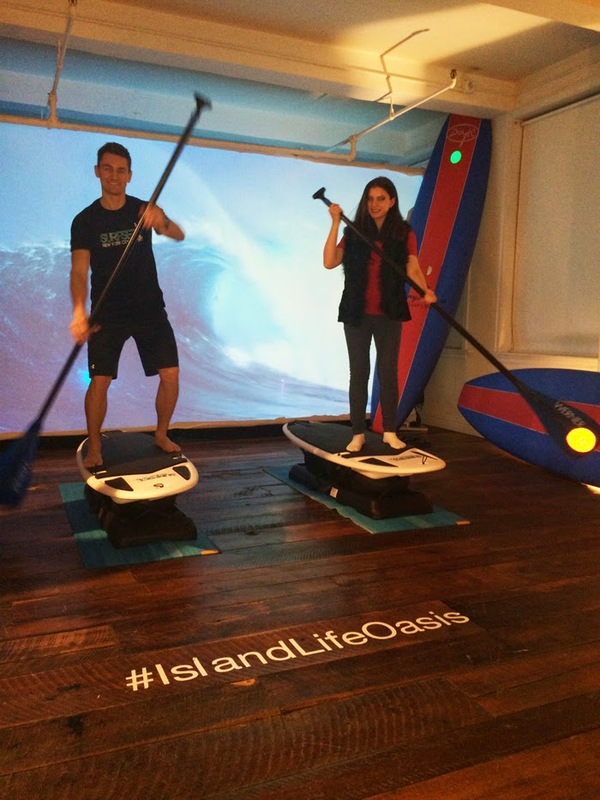 Leave everything else behind to embark on an aromatic retreat where you will be indulged with exotic cocktails, paddle boarding for the adventurer and more!” Umm, yes please! 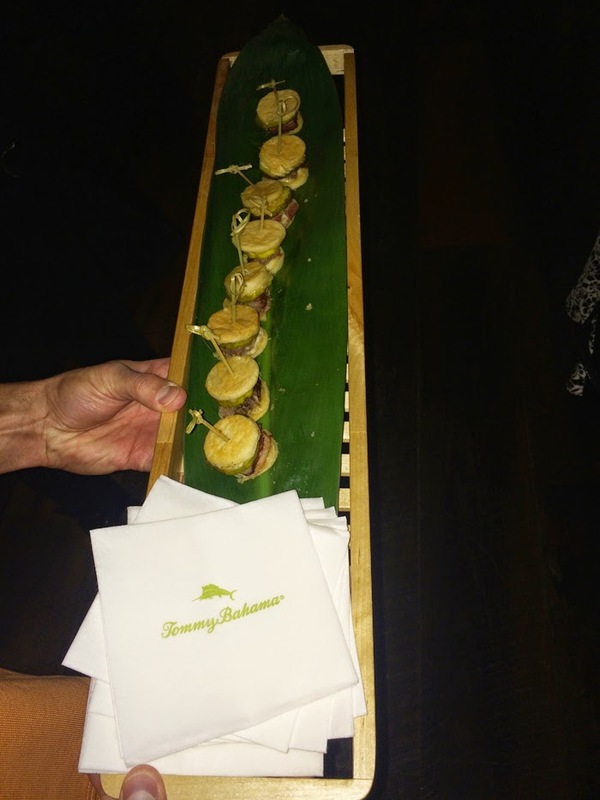 I was beyond excited to leave the frigid Winter weather of NYC and get a taste of Summer at Tommy Bahama's tropical retreat. 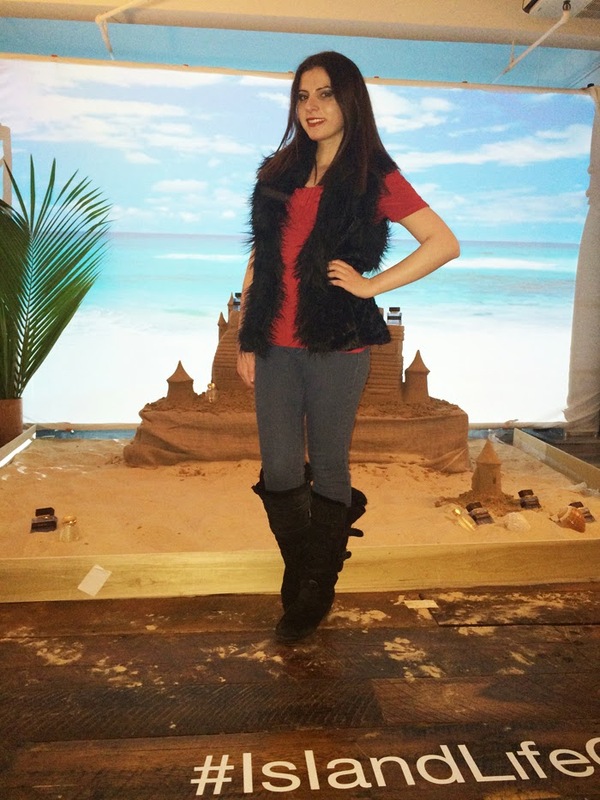 Dressed in heavy winter clothing I walked into Tommy Bahama’s beautiful paradise complete with a tropical drink bar, vacation worthy hors d’oeurves, sand castles, surfing, Tommy Bahama beach towels and of course their sweet new fragrances. 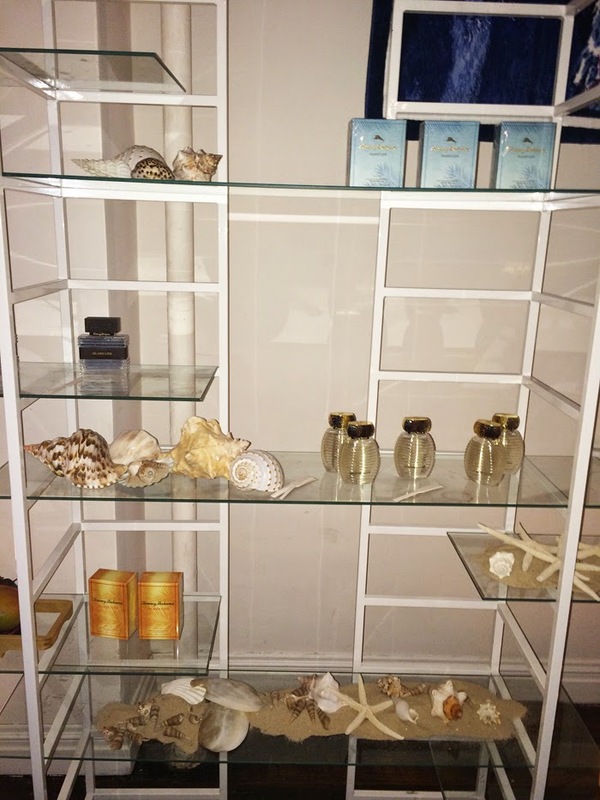 Tommy Bahama’s lovely new fragrances for men and women were displayed on shelves and perfectly complimented by surrounding beach seashells. 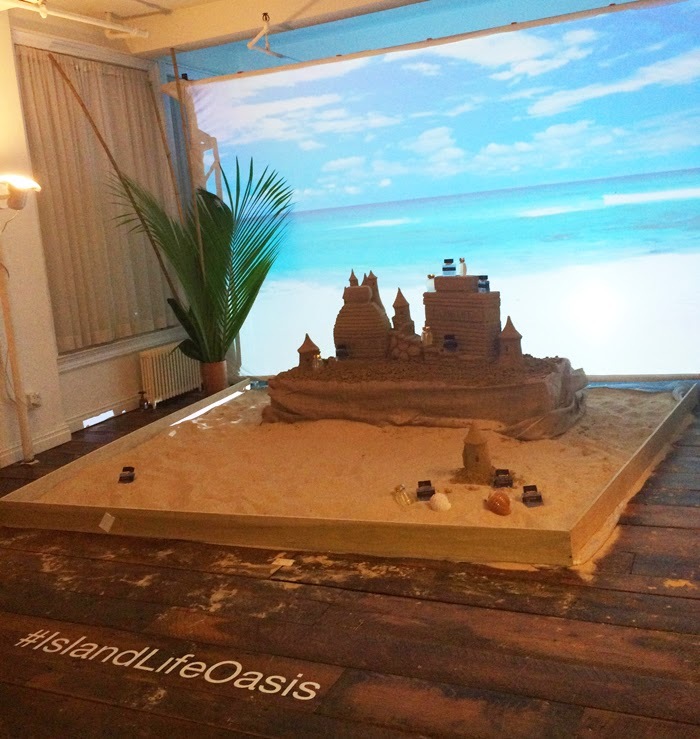 I sprayed on the new Island Life perfume for women which instantly made me think of a sweet day at beach. 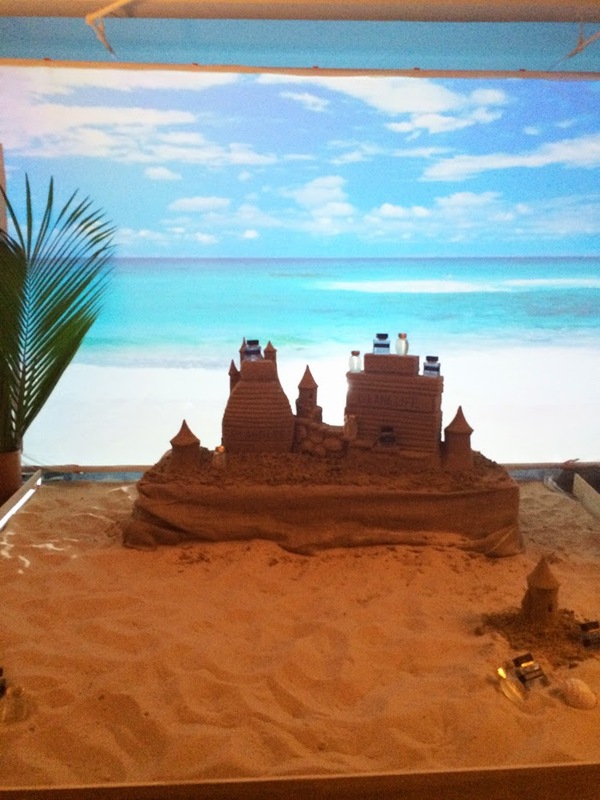 Who knew they could re-create that feeling in a bottle?! 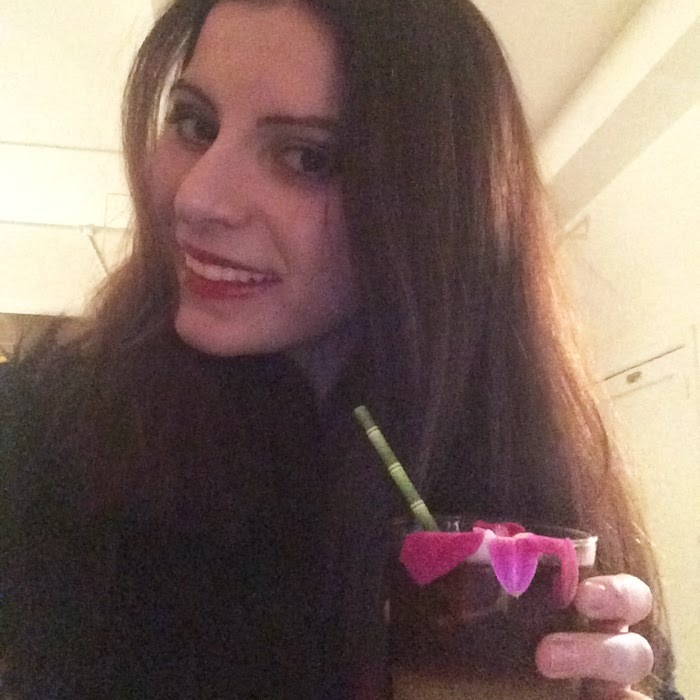 The perfume has an invigorating top of star anise that meets a center of radiant peach blossom. 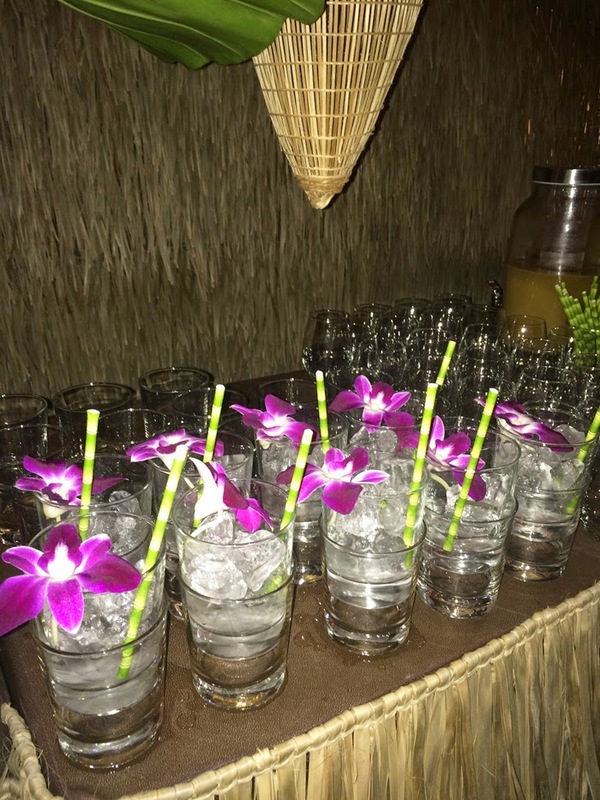 Base notes enveloped in rich vanilla bean complete the experience and are meant to make you feel relaxed, sensual and confident. 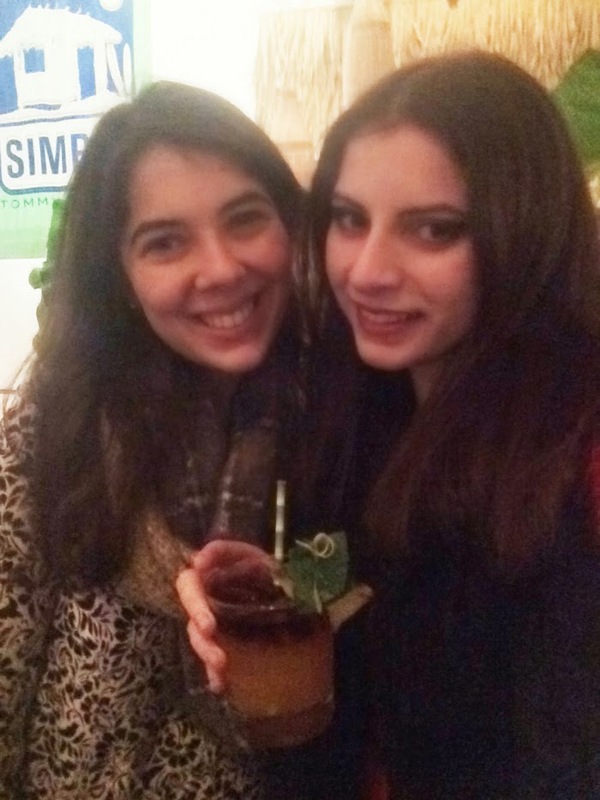 My lovely friend Michelle joined me that evening. 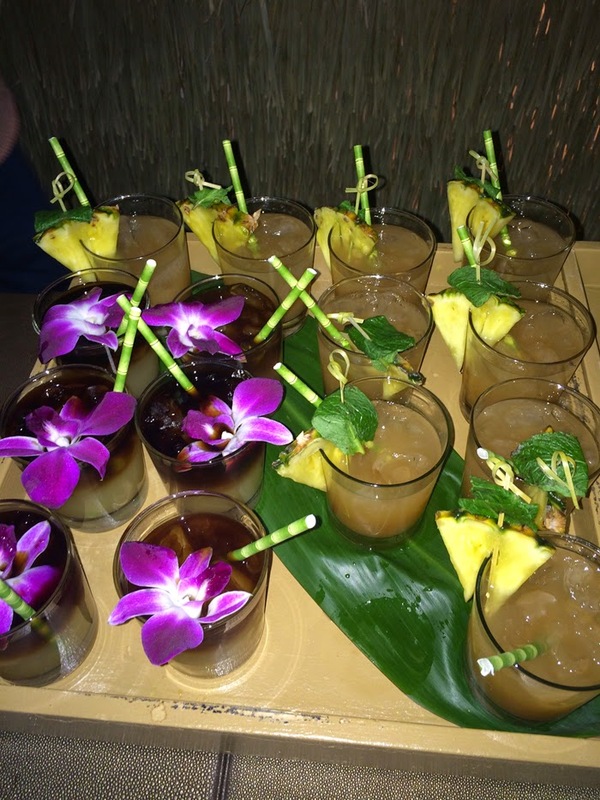 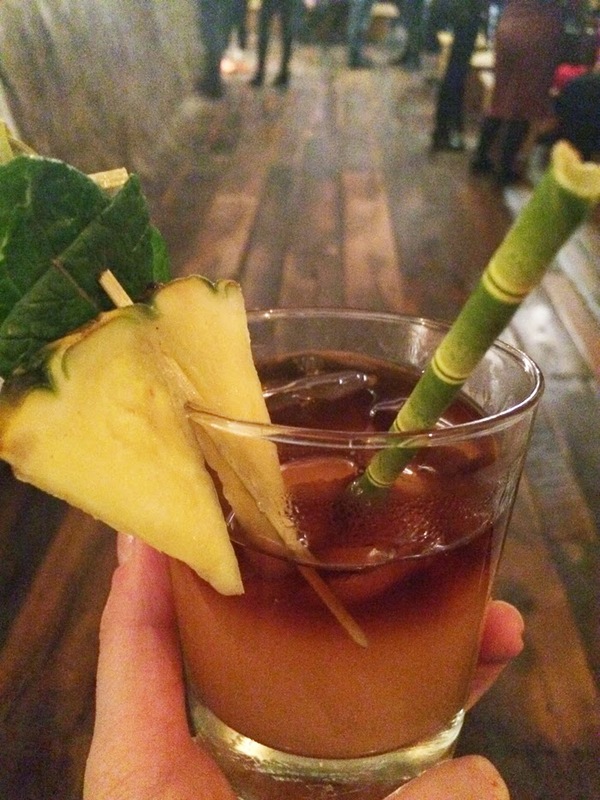 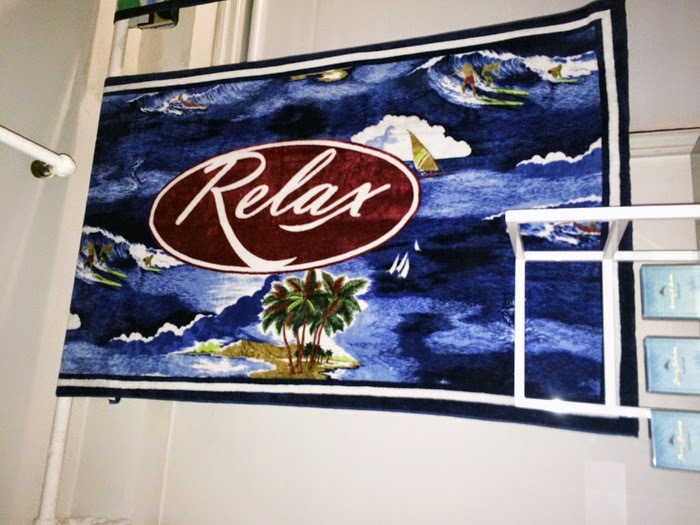 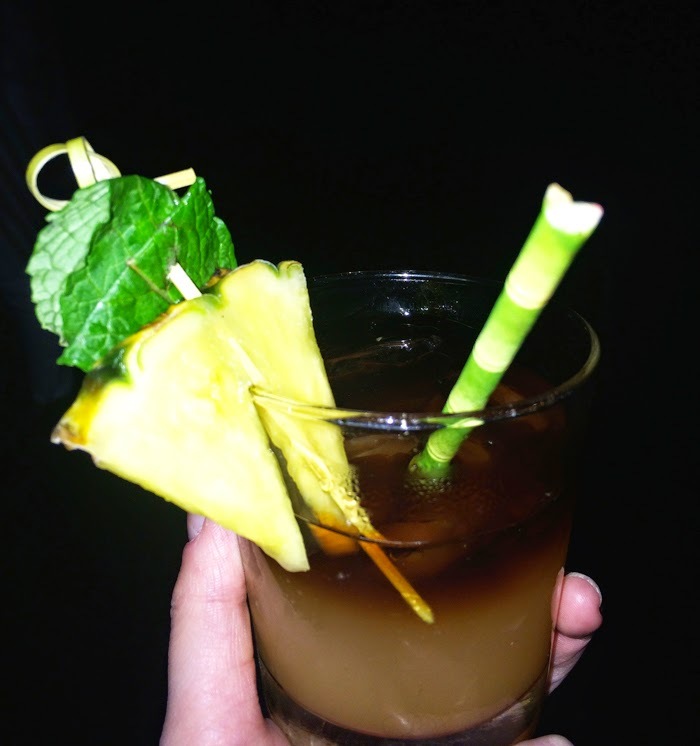 We had such a great time catching up and being a part of Tommy Bahama’s Island Life escape. 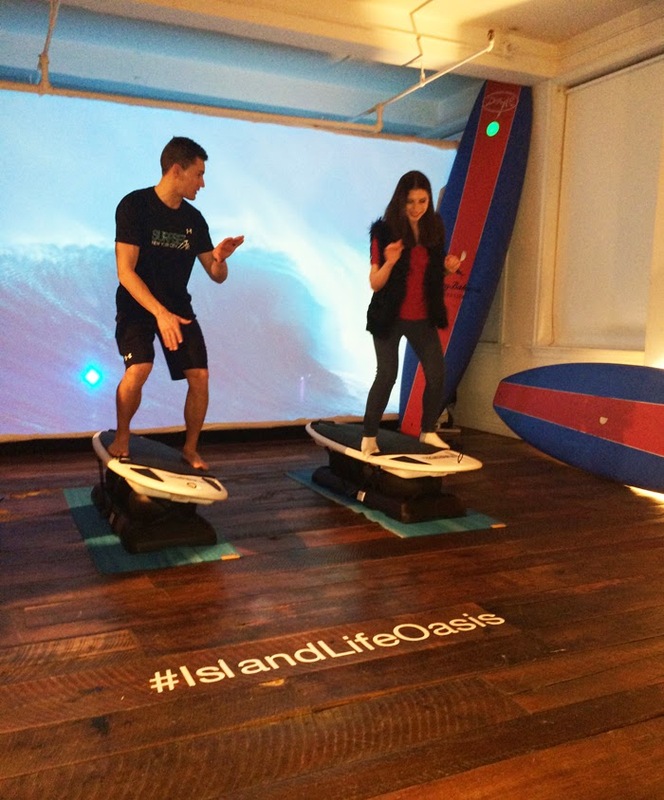 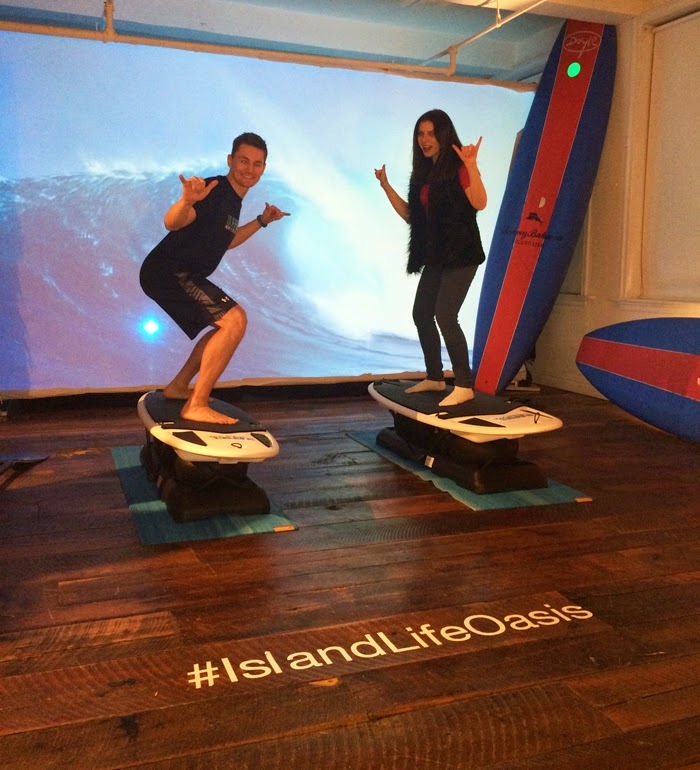 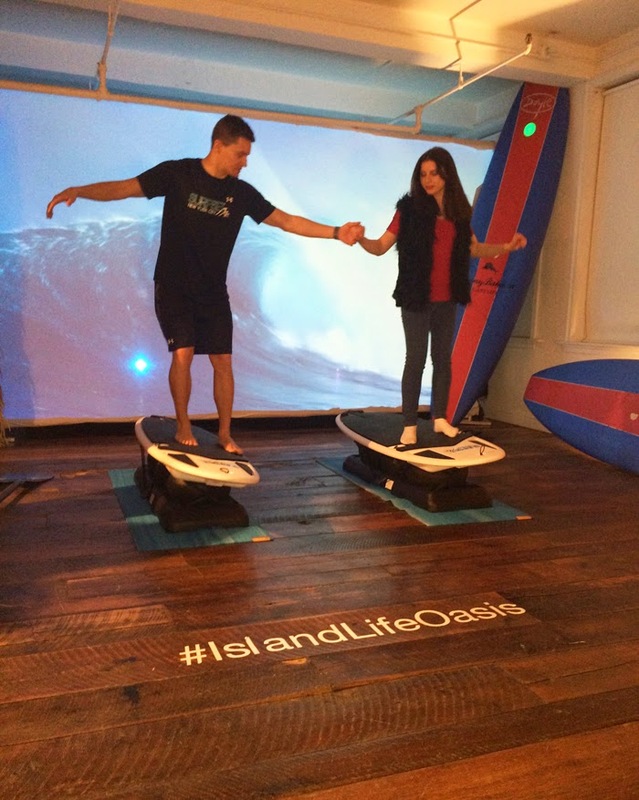 One of my favorite moments at the event was trying out Surfset’s surfing lesson which was harder than it looks! 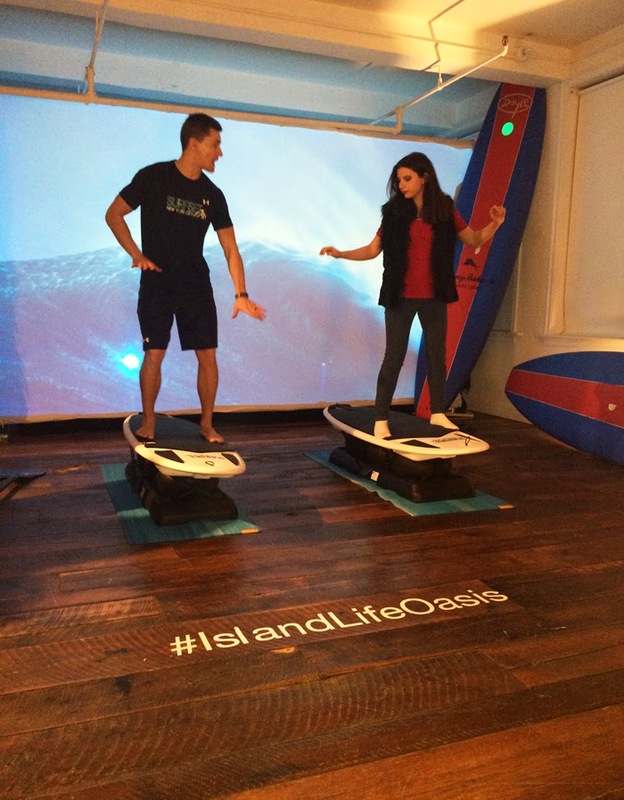 Luckily, I had a babe of an instructor to show me the ropes so I caught on pretty fast. 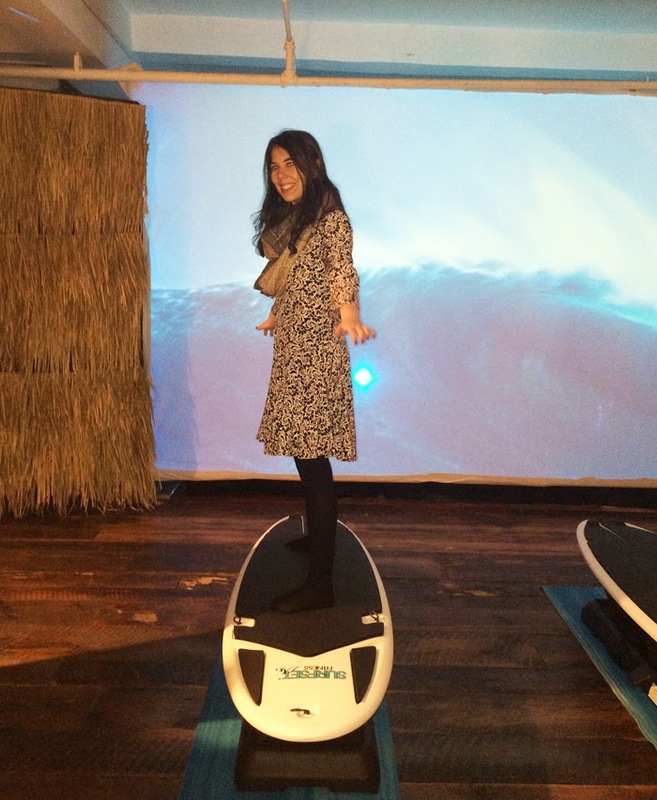 Can’t say I’m ready to hit the surf just yet, but it was definitely really fun to try the mock experience! 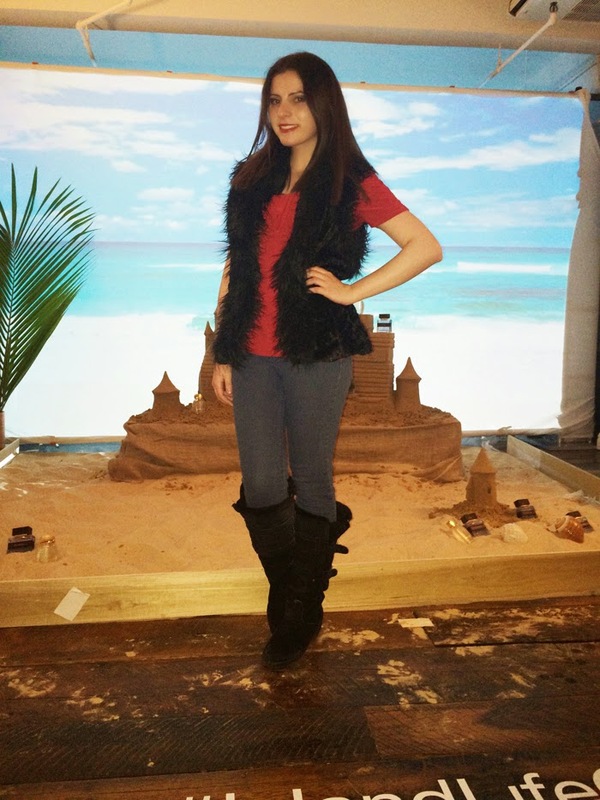 Thank you so much Tommy Bahama for having me! 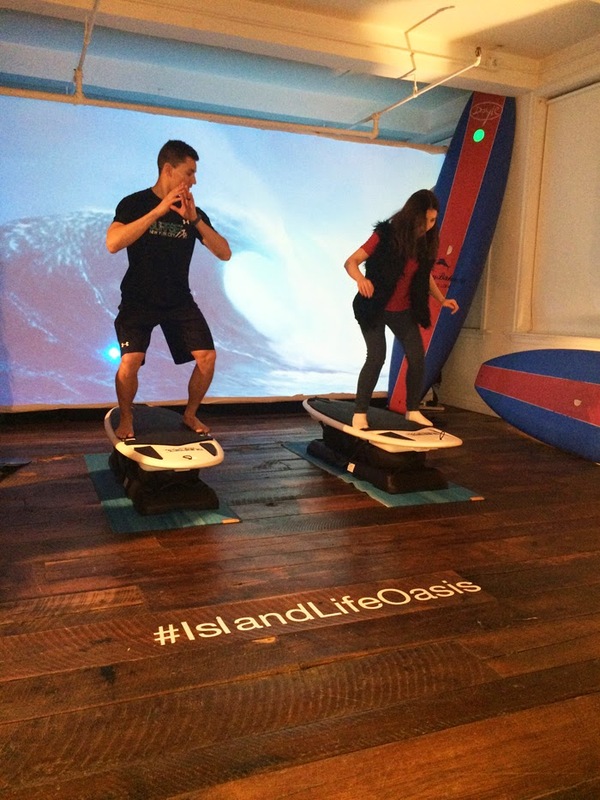 You can find their new Island Life fragrance in: Macy’s, Belks, Dillard’s and of course Tommy Bahama stores nationwide in March.